Now I'm nowhere close to being at a place where this is something I can actively work on (it'd be around January, with pockets of time beforehand), but I don't see any harm in aggregating the right resources in the mean time. 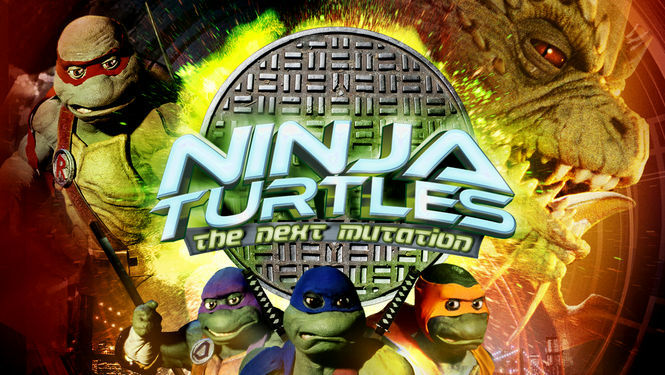 * Pore over all of NT:TNM, find an hour and a half worth of footage, splice it together to form a complete narrative and, as such, a TMNT feature film. Write a new script to suit. 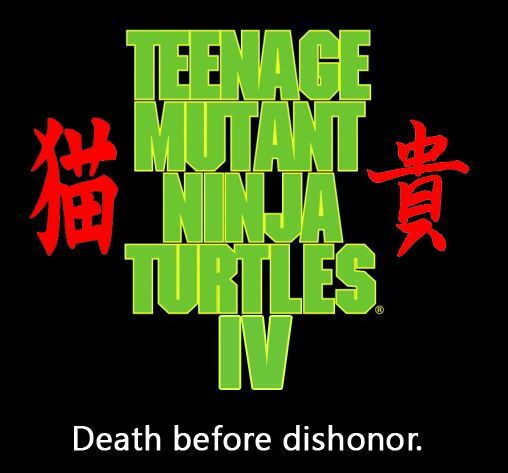 * It's a direct sequel to TMNT III. * It will be upscaled to 1080p, formatted to widescreen. * The color palette will be darkened and desaturated. * All music, sound, foleying, and voicework will be completely 100% scraped out of it. All of this will be redone. Music will be largely borrowed from TMNT 1 and 2. * I can digitally move the mouths a little better. Not a lot, but enough. * Construct a few new sequences in CGI. Got a guy or two who can do this for me. * Add blood, some legit violence. Basically make it a few shades darker than what we were promised with NT:TNM but a whole ocean darker than what we got. It'll still have laughs of course. What do I need? I need voices. 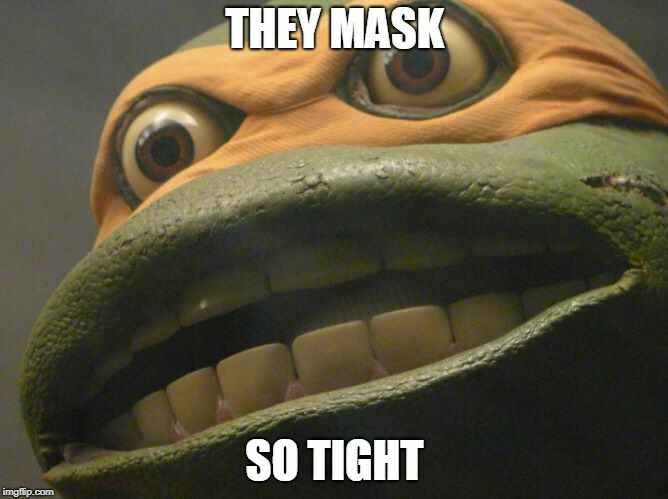 Can you do a Leo, Raph, Mikey, or Don or Splinter or Shredder that sounds like they did in TMNT 1-3? A Venus with a legit Chinese accent? Let's talk. Also anyone with any working knowledge of audio editing or foley... I can do these things serviceably but they don't fall under my direct specialties in film editing. Oh, and what are we going to call it? This. And no, that's not a subtitle. Last edited by Andrew NDB; 09-04-2016 at 12:57 AM. I can do a mean TMNT 3 Raphael, & decent Kevin Clash styled Splinter. I can help with forming a story however. Would you want to create maybe a skype chat or something that the project can be worked on? Whatever shape it takes would definitely revolve around the Dragonlord entering our world and the Turtles taking him down, hard. But I definitely want to use all the Shredder/Foot footage available, but maybe flipping it around. I need to rewatch all of them again (ugh) to see what's there before anything. The basic goal is, Turtles fight Shredder (sneaking in some explanation for how he survived II), Turtles defeat Shredder, Dragonlord enters the game, Dragonlord has Turtles rattled, and Shredder does... the right thing. You can probably see where I'm going with this. The trouble is, whatever we can write, we're more or less beholden to what was shot. Which can be cheated in many ways, but this is a complicated thing. Last edited by Andrew NDB; 09-04-2016 at 01:43 AM. I'd love to hear them. I know Tokka can do an uncannily perfect Splinter. Not sure what your budget is gonna be, or how much he'd cost for a day, but the Banks brothers got Robbie Rist to do that Casey Jones movie a while back. That might be worth a shot. I wouldn't mind asking the voice cast. The worst they can say is "no." I can't do voices, but if you need any help with music editing I can offer my services. I can PM you a few examples of what I've done in the past. I can certainly help with writing parts and some jokes. Otherwise, shoot me a PM Andrew of a few lines for each character and I can try my hand at voice acting. Shredder only appears in the first two episodes, and then another episode later where he's a bum in rags and has long hair. The Foot are only in the first two eps. Any reason why there's no separate sub-forum for Next Mutation? It's brought up enough to warrant one, I'd think. I get that, but wouldn't having its own section keep people from coming in just to sh*t all over it? Don't people have anything better to do with their time? I agree. I actually liked the concepts of a lot of the villains in the show and was hoping to see a reattempt at some of them (Dragonlord, Bonesteel...) on the Nick toon since they seem to have no problem reintroducing things from various TMNT history, but other than the Venus sticker on the Shellraiser, its been dead on the NM stuff. What would you be using to record the voices? Any recommended platforms? I'm fairly good at voices and impressions all around, so if there is a character that you need filled, let me know and maybe I could work on the voice. Honestly if he's looking for voices, he should go with people with at least some professional talent in the industry. If he can't get anyone good, then use forum members. Pretty much any program would do, I can clean up audio noise and such. The most important thing is equipment. A good mic, a quiet room, no peaking. I'd probably be too rubbish to do the voice but I wondered what Donatello voice are you going for? Corey Feldman or Adam Carl?